Children with cerebral palsy are prone to numerous difficulties due to the invasiveness of the disorder, and one such difficulty that surfaces in many children is dysphagia. Dysphagia makes swallowing difficult for babies and kids who develop the disorder, but fortunately, there are numerous treatments that have proven helpful. The word dysphagia is the medical name for difficulties with swallowing. When children develop dysphagia, it’s generally due to esophageal problems. For instance, the body’s esophagus may have trouble pushing and moving foods and liquids into the stomach. 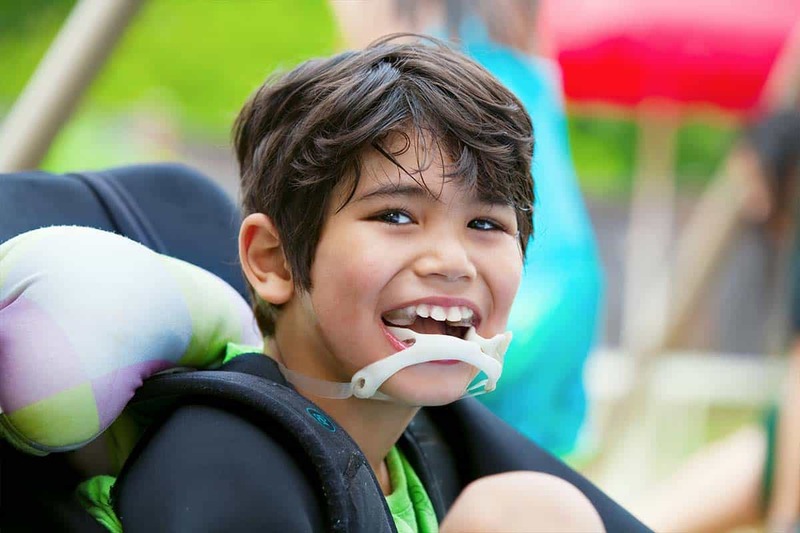 Although dysphagia can happen to anyone at any age, children with cerebral palsy are more susceptible because the disorder affects the central nervous system. Many children with cerebral palsy also have brain damage, another issue that affects their ability to swallow properly. Keep in mind that if your child occasionally has troubles with swallowing, this doesn’t usually indicate dysphagia. Yet, if the problems are consistent and on a daily basis, it’s important to get medical help as soon as possible. According to the Mayo Clinic, the following are the most common symptoms of dysphagia. Not all children will experience every symptom. Esophageal Dysphagia: This type of dysphagia is marked by malformations in the lower portion of the esophageal sphincter. Oropharyngeal Dysphagia: Oropharyngeal dysphagia is marked by muscle and nerve malfunctions in the esophageal sphincter, oral cavity, and pharynx. An ultrasound is performed in order to determine problems in the esophagus and the surrounding muscles. It’s typically performed by using sound waves to find any issues. A swallowing test, also known as a dynamic swallowing study, is performed by having the patient attempt to eat different textured foods that are covered with barium. A test is them performed to see how the foods move the through the system. The barium provides a way for physicians to get images via X-ray of the esophagus and other areas where problems may occur. Imaging tests such as the CT scan and the PET scan are administered to allow doctors to view cross-sectional images of the soft tissues and bones in the child’s body. In some instances, an additional scan, the MRI scan, will be administered so that doctors can view in-depth images of the organs and tissues. Doctors test acid in the esophagus by using a small catheter that’s inserted in the child’s nose and sent to the esophagus. The catheter can then detect if there abnormal levels of acid in the patient’s esophageal area. Other tests and exams may be performed as well. Your child’s doctor should be able to explain to you in detail what tests and examines will be administered. The first treatment option that doctors usually recommend is changing food choices and helping children learn different swallowing techniques. For example, foods can be pureed so that your child can swallow easier and thicker liquids to drink is encouraged. Swallowing techniques may include face and jaw muscles exercises carried out by a speech pathologist or an occupational therapist. Chin tucking is another technique that helps children with swallowing. It consists of helping the child position his/her chin correctly which can assist in making swallowing easier. Prescription medication is another option that may help with dysphagia. However, medications are usually more helpful for those who have swallowing difficulties due to GERD, and therefore may not work for every child. If the patient has malformations in the esophagus, physicians may administer an esophageal dilation. This form of treatment entails a doctor using an endoscope with a balloon attached, to stretch out and dilate the esophagus. Surgery is also an option, but reserved for severe cases of dysphagia. During surgery, a physician will remove obstructions, strictures, and rings from the pharynx area of the esophagus. The long-term outlook will depend on how severe dysphagia. If treatment proves effective and the disorder is worked on at home under doctor’s orders, the prognosis is favorable.